The overall aim of highlighting the issues mentioned above is to firstly make you more aware of your cash position which will ultimately help you to improve it. The ability to monitor your cash flow situation is hugely important when it comes to trying to get your business to thrive under pressure. By simply being able to follow good cash flow procedures your business will reap the rewards almost instantly when it comes to building and growing your company. Having a good cash flow situation will make the payment of debts easier. The ability to pay your bills on time and avoid due deadline dates will create better relationships with your suppliers. Top Tip: Having a good track record paying your bills will create greater understanding if the situation ever arises where you cannot pay a bill on time or are seeking out financial help. Being able to pay your bills on time means there will be no impact on your credit rating. Having a good credit rating is very important especially if you are looking for financing later on in life. When you are constantly under financial difficulty a lot of stress can come with the territory. It can impact your life greatly. Getting into a good financial position is important for not only your business but your own life as well. Top Tip: When you are running a business wages become a huge part of your expenses. Having a positive cash flow takes away a huge amount of stress when it comes to paying employees and lets you focus on growth and expansion. A good cash flow position brings with it a lot of benefits. Having a proven track record with money and being able to manage your finances has a lot of perks to it. Better interest rates being just one example. Once a business has established a good cash flow history and has a cash flow that is positive, it is then best placed to look at expansion plans for the business. Potential lenders will expect past, present and future cash flow projections to assure them that the business is on a solid footing. At this point it’s worth pointing out that an accounting software package will be of enormous benefit. Used properly it will do all your heavy lifting and help you tick all the boxes on the cash flow checklist below. Thank you for taking the time to read our three-part series on cash flow. 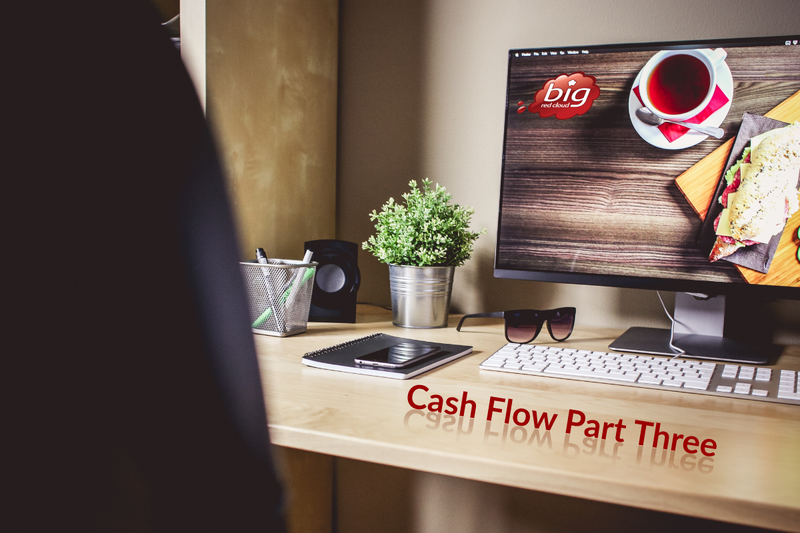 It’s such an important subject and we hope that we have made it clear that cash flow is one aspect of your business that you need to be on top off. Forecast: Have you planned for your future incomings and outgoings? Identify large and recurring outgoings. Invoice immediately: How long does it take after you make a sale to invoice? Details: Is your invoice addressed to the right person and are your correct bank details included? Payment terms: Is your payment term correct for your current cash position? Follow up: Have you followed up promptly seeking payment once the payment term has elapsed? Deposit: Is the order from a customer large? Do you need to spend a lot to complete it? Consider requesting a deposit. Credit limit: Do you have a customer that pays late regularly? Consider a credit limit to protect your cash position. Your bills: Are you waiting until the payment term is up before you pay? This is a free period of credit for you. Details: Are all the necessary details on your invoices. Taxes: Remember the second bank account to hold the monies you must pay the taxman.